The use of colour to enhance the appearance of hair has been used by people for centuries. Closely influenced by developments in chemistry and cosmetic manufacturing, the range of hair colours and products available today is huge. But before we colour our hair, we need to understand basic colour theory for hair. Here we look at how natural hair gets its colour, what depth and tone mean, and how we use colour theory to correct tones. All colours found in nature are a mix of the three primary colours: blue, red and yellow. These three pigments produce every known colour in the world, except black and white. Our skin and hair colours are made up of various combinations and proportions of blue, red and yellow colour molecules. Blue is the only cool primary colour – red and yellow are warm. Primary colours in our hair vary in molecular size and pigment weight – and this is important to understand in hair colouring. Blue has the largest molecular size and pigment weight, followed by red and then yellow. In the hair shaft, blue molecules (being the biggest) sit closest to the cuticle and blue is the easiest pigment to remove during colouring. Red molecules are found deeper in the cortex and are harder to remove than blue. 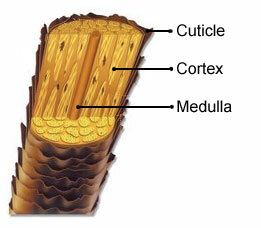 Harder still are the yellow molecules, which sit deepest in the cortex. This is why red and yellow are harder colours to remove during the lightening process, as these pigments are deeper inside the hair shaft. To remove red and yellow pigments, the hair shaft needs to be expanded large enough and for long enough during colouring to allow oxidation to dissipate the molecules into the air. Our natural hair colour depends on melanin pigments within the cortex of the hair. Eumelanin provides black and brown pigments and determines how dark hair is. More of this pigment present in someone’s hair gives the overall hair colour a “cool” look, like ash. Eumelanin pigments consist of all the three primary colours: blue, red and yellow. Pheomelanin provides red and yellow pigments. This gives rise to warmer colours in someone’s hair, like auburn, strawberry or gold. Brown hair contains a lot of eumelanin, red hair has large quantities of pheomelanin, while light blonde hair actually contains relatively little melanin – the pale yellow we see is actually due to the keratin in the hair, rather than pigments. White and albino hair contains little or no pigment at all. Ageing can affect pigment production. As we age, melanin stops being made in our hair and new hairs grow without pigment, which is why they are white. When white hair is mixed with hair that still has colour, it creates a grey look (sometimes called “salt and pepper”). Blonde children can sometimes see their hair darken when they are around seven or eight years old, and have dark hair in adulthood. It darkens as melanin production increases. Environmental factors can impact hair colour. Oxygen in the air attacks the pigments in hair. Blue pigments are the weakest pigments and are, therefore, the first to disappear, leaving hair with the warm undertones showing through. Humidity and wind brings more oxygen to hair, and sunlight accelerates the process. Hence why our hair often lightens noticeably when on beach holidays. Health issues can contribute to premature greying e.g. autoimmune thyroid disease, vitiligo and ageing syndromes. Medication can alter natural colour e.g. certain drugs used to prevent malaria can lighten hair, while some epilepsy drugs can darken it. Pregnancy can darken light hair due to higher levels of hormones oestrogen and progesterone. The hair colour we see consists of depth and tone. Hair also has an undercoat of colour, called undertones, which only come into play when we lighten or colour the hair. Depth simply refers to how light or dark the base colour of the hair is. It is also called level, with dark hair having a low level and light hair having a high level. In hairdressing terms, there are 10 main levels. 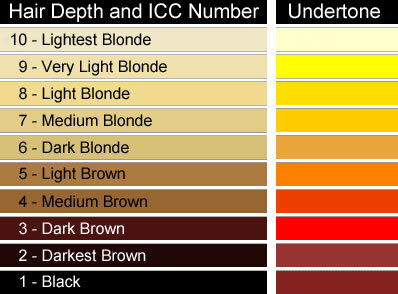 Numbers 1-5 are brown (black, darkest brown, dark brown, medium brown and light brown) and 6-10 are blonde (dark blonde, medium blonde, light blonde, very light blonde and lightest blonde) – see the chart below for numbering. All are neutral shades. Warm tones have reds, yellow and orange in them, and are in colours such as strawberry blonde, copper and chestnut brown. Neutral tones have a balance of warm and cool pigments in them. Cool tones have blues and greens in them, and are often referred to as ash tones. For hair colouring products, the tonal quality of the finished result is often given as part of the colour’s description (e.g. intense red, honey blonde, rich copper, light beige blonde, deep chocolate). There is also the ICC colouring system, with each tone being given a number. Natural hair has an underlying warm tone, dictated by the amount of the pigment pheomelanin found in the hair. Dark hair has more pheomelanin present, creating a red undertone: blondes have less, resulting in a more yellow undertone. The undertone becomes more evident when hydrogen peroxide is used to lighten the hair. The undertone also shows through when hair is naturally lightened from exposure to the elements. Pheomelanin is slowly oxidised during colouring and can produce those difficult-to-remove golden and orange tones in the hair. When dark hair is bleached sufficiently, it will go from having a red tinge to orange, yellow and, finally, white as the pheomelanin breaks down. Undertone can affect the final colour result when dyeing hair. Correcting tones in hair needs an understanding of colour theory, as well as knowing what products to use and application techniques. To neutralise an unwanted tone, the opposite colour on the colour wheel is used. So, to remove a gold brassy look from blonde hair, we use a purple shampoo or a mauve ash toner to knock out the unwanted yellow. If the brassiness is more orange, then a blue-based product would be used. If hair has a green cast to it (sometimes caused by dyeing hair with an ash colour), a red-based product is used (yes, including tomato ketchup!). The colours opposite each other on the colour wheel are also opposite in terms of tone – that is, warm colours neutralise cool colours, and vice versa. For example, red (warm) and its opposite colour green (cool) neutralise each other. Completely neutralising the effect of a tone achieves a neutral shade that is neither warm nor cool. To some extent, the clothing worn by the person, or the environment they are in. So, as well as knowing your colour theory, you should also consider other aspects of working in film, TV or theatre. Understand how lighting affects colour, how the colour and material used for costumes and sets can reflect onto hair and skin, and how different hair (from natural to wigs made from various types of hair) can look on camera or stage. Lloyd, T & McMillan-Bodell, C. 2005. The Colour Book: The Official Guide to Colour for NVQ Levels 2 & 3. Cengage Learning Vocational. 260pp. Palladino, L. & Green, M. 2006. Hairdressing: The Foundations. 5th Edition. Thomson. 416pp. So being a little lazy and a little cash strapped i was trying to avoid the salon!!! i used a packet dye, which i don’t usually like to do and my roots came out a horrid Orange!! My hair is blonde and I know it does throw alot of gold however i thought I chose the correct dye, obviously not!! I tried to combat the orange but nothing worked. I then trotted back off to the hair shop and purchased another 2 tubes (this time) of colour, it was a permanent colour 9C Solfine colour Very Light Ash Blonde, however it did not lift any of the orange at all, Previous to this I did use some lemon juice and baking soda with head and shoulders to strip some of the old colour first which seemed to work quite well. So I am guessing nothing is going to actually lift my roots but bleach, now I have bleach and have done all of this at home before, but my question is even though i have put my hair through so much torture over the last couple of days can I now bleach my roots? or should I give it a couple of days at least. My hair feels really good as I have been loading it with good conditoners and treatments in between the washes. I also didn’t put any colour of my hair past my roots (maybe a bit here and there which is unavoidable!!!) my next question is once I have bleached my roots to get rid of the orange can i then reapply another colour over the top? I have another colour of tube colour which is Solfine 32(101) HL ASH, and do i apply this on dry hair or apply on wet hair as a toner and what developer do i use for this, I have 5, 10 or 30v at home now. thanks in advance and sorry for the lengthy question!! Why we need to see undertones while prelighting the hair. Hi. Please help. I am just new in hairdressing field, still confuse of hair color. My client wants a caramel like color. Her hair naturally a level 2 and was colered level 4. She wants a lighter color. Im thinking of giving her a low density full hed hilights and color 6.31 revlon.What do u think? You can use 40 vol and color! Hi can you please give me some advice, I put highlights in my hair with a home highlighting kit then I put a home colour in hair very light ash blonde over it a there now tint of green off the highlights. What can I do.. This article is a great refreshment on helping you with colour. I watched a video last night and she was going over colour theory which she got wrong with what 1-3 underline pigment colour is. This really confused me that I was thinking after 16+years I have been doing everything wrong?!!!. Then I found this very thorough wonderful article and thank God it wasn’t me it was her giving out the wrong information. Thank you I will be saving the site and use it from now on. I dyed my ends blue, eventually it became green/blue but I put a brown over it and got a darker green. After that I added a red which only made my hair purple? like a dark reddish, thinking it was fine to add brown, I did. Now my hair is blue brown at the bottom, no matter what I do I simply cannot have brown again. I dont want to bleach it again, I refuse but what can I do? Best thing would be go to a good colourist at the hairdressers – sorry, without seeing your hair it’s tricky. And trying to resolve it at home, you’re likely to keep going round in circles. It became green because brown has blue in it. I would go to Sally’s and buy color removing and depending on the tone your hair comes out after using the removing will depend on the toner you use. I’m doing a 7th grade science fair idea with hair colouring and hair and this really helped me!!! Beautiful post and so in depth! Your problem wasn’t so much the sallys product NOT working-as it was that you had two different dyes on your hair and it worked on both. The purple was mostly gone already so it removed your 7N and left its base tone of green. Wow… this is one of the best and most easy site which i came across during my traning i use to check lots of sites but i didn’t see the proper site which I’m looking for but finally just before i complite my course i found this site I’m so happy that i can understand this articles very easyly…. Thank you so much… and please give use some more…..i love to read… Thank u again…. Thank you so much for spending your valuable time posting this easy to understand information. It was extremely helpful to me! Have an awesome day! I never leave feed back but after reading this I feel I need to. I’m an apprentice in a salon which is very colour based. I have been there for nearly 3 years and am just coming to the end of my training. Although I have had colour theory training I still felt there was a lot l didn’t understand but after reading this is it seems to have clicked! Normally these things are really boring and just repeat the same thing over and over making them horrible to read. But I found this so easy to read and the more I read the more it seemed to click. This post is actually amazing and I will definitely will be sharing it with friends/other trainees. WOW – what an awesome website filled with in-depth information on colour understanding which forms the base for understanding hair colouring and how it works. Thank you so much. Hi Christina, Thank you for letting us know 🙂 We’re always happy to know our posts are useful. Cheers! This is a nice blog. It is informative about hair color and its care. I just learned more about hair color and care from here too. Great site! Wow, this is interesting and educational too. I now understand more about hair and how we should take care of it especially if we want to change its color. I have black hair and I love red heads and so I want it too in my head, so I tried dyeing mine. But it just turned like reddish-purplish. At least it is reddish. Great site! Cheers! Beautiful post and so in depth! I love your site! Too long? I wish they were longer and in more detail! Speaking as a non-professional/ amateur, I understand that not as many people will be interested in an in-depth analysis as most tend to stick to 10 minute tutorials at most. Those of us who are interested in these aspects though and are lucky enough to chance upon your site will be interested because this is exactly what we are looking for. I don’t particularly care about what company brings out which product every 10 minutes, but this right here is gold! Reading your posts has changed my understanding on a lot of aspects of hair and make-up and has pushed my skills forward! Frankly, I wish all this was an obligatory class for every hair and make-up artist out there since it’s their inability to understand these basic principles that left me disappointed every time I sought their council or to help me with my style. In fact I just went out earlier to buy ink for my printer in order to print out a few of your posts and keep them with me next time I have time to spend in front of the mirror and to keep notes! Yes, the modern world seems to have a short attention span! One of the reasons this site was set up was to “fill in the gaps” of a MUA’s understanding as, sadly (and as you have experienced) makeup training so often falls short and too many people who do a course think they know it all. They know bugger all – makeup/hair takes years to truly master. Many thanks for your insightful comment, and we’re chuffed you find our posts useful. Have a great day.